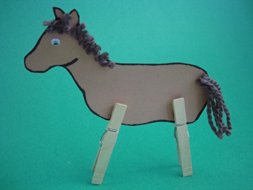 This Clothespin Horse is a super fun and easy horse craft for kids made with our printable template. Add some simple embellishments and you've got yourself one cute horse that stands on his own! 1. Print out your horse on brown construction paper and cut it out. You can also print it on heavy white paper and color it. 2. Cut small strips of yarn and glue them along the horses neck for the mane. Cut a few longer strips and glue them on for the tail. 3. Attach your clothespin legs and glue on a google eye on either side of your horse and you're done!